After the “Baby Trump” balloon successfully took flight in the UK, it’s now about to become a trend here in the states. According to local organizers, a series of six Baby Trump balloons are schedule to debut around the US. The first one is schedule to fly in New Jersey next month to coincide with planned protest against Trump’s policies, the Detroit Free Press reports. Girvan and fellow activist Didier Jimenez-Castro are working together to set up Baby Trump tour appearances in various cities across the country. They expect that the next appearance will be in California. Girvan organized a GoFundME and raised $24,000 to buy the balloons. Now that the balloon has made its way to the states, we’re sure Trump will tweet about it since he lets anything will get under his thin skin. 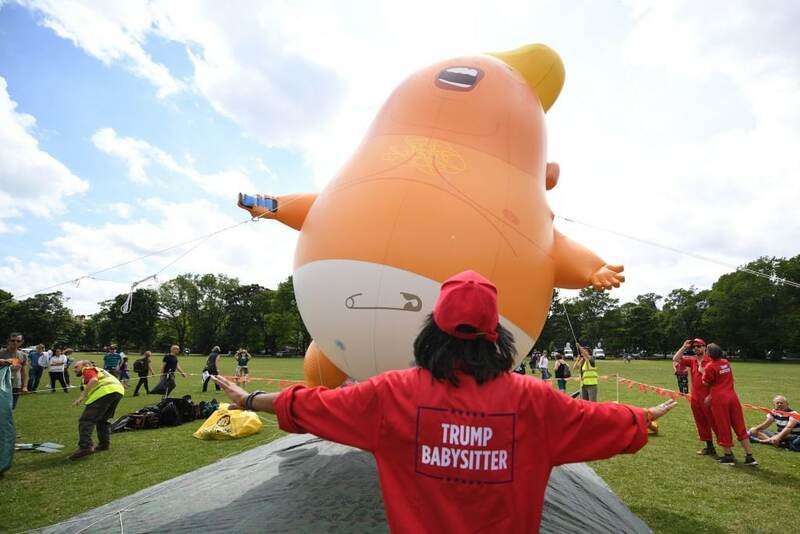 It worked for the Brits who recently sailed a Baby Trump balloon high on July 13, at the same time as the “Stop Trump” march in central London during Trump’s international visit. In addition to balloon mocking the president, New Jersey residents also have a billboard to contend with. A billboard in Union Township in New Jersey, prominently displaying a picture of President Donald Trump with the caption: “Our leader the idiot” has reportedly angered residents. Some people in Union Township have called for the municipality to remove the “potentially offensive” billboard parked on Morris Avenue. However, Union Township Public Information Officer Natalie Pineiro said there’s not much they can do about it since the political billboard does not violate any local ordinance or laws. “It’s clear what his intentions were and now the township has been the recipient of his circus-like crusade,” Pineiro told New Jersey News.